Wild animals that come into urban and suburban areas can be a problem, but even for those living in the countryside, finding an animal is on the roof of your property can be an issue. While roofing materials are quite durable and will usually be able to resist the majority of the weather thrown at it by the passing seasons, animals can often cause damage as the surface of the roof isn't designed to deal with regular contact from animals. In some cases, animals such as raccoons and squirrels can use their dextrous paws to cause damage that will allow them to get into the roof space, so if you do see an animal on the roof it is important to try and get it quite quickly. This is a situation where you can have some sympathy with wild animals, as it can often be much easier to climb on to the roof than to get back down, and for agile animals like feral cats they can sometimes get on to the roof but then can't get back down. If the animal appears to be in good health, then propping a long plank of wood against the edge of the roof can sometimes draw the animal back down to solid ground. Some animals will be too timid to follow such a path to the ground, so in this case you will need to help them down, but catching them can be quite a challenge. Make sure you wear thick protective clothing and gloves, and take a large box or washing basket with you to try and catch the animal before carrying it back down. Birds are another common species that can be spotted on the roof, and while they do not generally cause significant damage, they will often leave droppings on the roof which can leave unsightly stains. Birds will generally land on the ridge of the roof, so one good way to prevent this is to either install a weather vane or another kind of moving roof ornament that will scare the birds away. Bats will not generally be seen on the surface of the roof, although they can often be nesting in a roof if they have found their way into a roof cavity, and may land near an exit point in order to get in and out. If a bat remains on the roof for more than a few seconds, it will often be injured or ill. There are plenty of different species that have developed their climbing skills as a survival mechanism, and for animals such as raccoons, squirrels, flying squirrels and other climbers, they will often be on the roof for a reason. In some cases they will be finding insects on the roof to eat, but in most cases they will be getting on to the roof because they have found an access point that has allowed them to start nesting in the attic or roof space. 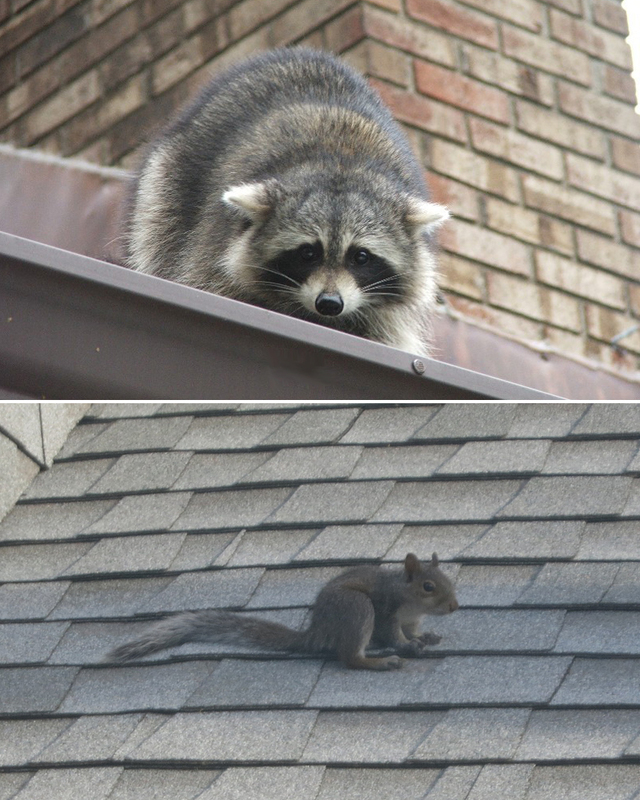 If you do spot these animals on the roof, then it is worth observing them to see if they actually find a way into the roof cavity, and if they do you will need to take action. If there is an injured animal on the roof, or it falls from the roof and is injured, one of the most important things is not to put yourself in harm's way. If you can catch the animal, then placing a large sturdy box or a strong washing basket can help you to catch them, and then putting a blanket over the box can help to calm the animal. You should try to take an injured animal to the vet, and while in most cases they will be able to do little more than give the animal a merciful death, it is certainly better than allowing it to try to survive and die a long, lingering death. Depending on the type of damage that you can see on the roof, you may need to call in a roofing specialist to carry out repairs on the tiles or the soffits, or replace vents around the roof area if these have been damaged. In some cases, animals such as bats, raccoons and squirrels may have found their way into the roof cavity, and in this case you may need to repair any entry holes and replace items such as soiled insulation. When it comes to stopping climbing animals from getting on to the roof, it can often be quite difficult, but removing overhanging trees and shrubbery that can help the animals to get on the roof can be a useful technique. While it is impractical to cover the roof in anti-bird spikes, placing these on the ridge of the roof can help to stop pest birds from landing on your roof and causing problems.